Tim Maryon was born in Twickenham, London in 1989 and has been involved in music and art in some way or another for as long as he can remember. His father is a pianist and piano teacher and this early exposure to music has had a huge influence on Tim’s life. In 1999 Tim received a DfE Scholarship to Wells Cathedral School to study Percussion, where he spent 10 years studying with Jayne Obradovic and Jan Faulkner. His musical education at Wells was rich and varied and it was here that his interest and passion for composition was ignited. In 2008 Tim began studying Composition at Trinity College Music with Stephen Montague and Deirdre Gribbin. Here he is exposed to a variety of techniques and has written music for several short films, winning the Daryal Runswick prize in association with BFI for his work, ‘Wrinklys Steam Locomotive.’ Tim has also worked on several collaborations with choreographers, which have been performed the Laban Centre for Contemporary Dance. As well as this Tim continues to work on his own music which spans from solo works to large orchestral pieces. 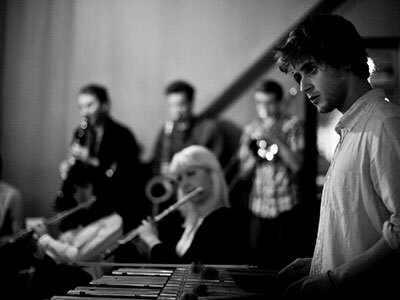 Apart from composing, Tim is the Percussionist for the London Soundpainting Orchestra. This is an ensemble that composes using a live composition sign language, created by New York composer Walter Thompson, for musicians, dancers, actors, poets, and visual artists working in the medium of structured improvisation.